Bead stud bracelet By Maggie Roschyk - Adorn your wrist with the new two-hole bead studs, framing them with peyote stitch worked in peanut beads. Enchanted garden ring - Use crystals, pearls, and seed beads to create a stunning flower ring that will catch everyone's attention. Handmade metal clay leaves are a sweet touch but can be replaced with charms trimmed from leaf chain if you prefer. Knot your average pearl necklace By Ayla Phillips Pizzo - Use two styles of knots to accent large-hole pearls strung on leather cord. 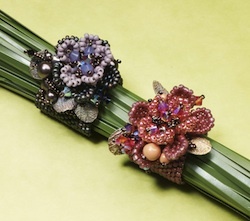 Colorful blossoms By Lorraine Coetzee - Create a shapely bracelet base and flower petals in brick stitch, bezel the flower centers in peyote, and then put all the parts together to create a stunning accessory! 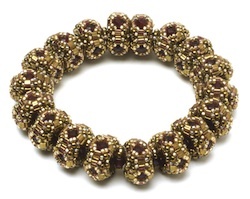 Beaded bead parade By Yvonne King - Fire-polished beads look like rubies as they peek through these gold-tone rondelles stitched with round seed beads and triangles. One rondelle leads to the next as you work the bracelet as a continuous piece, and the end beads hide a magnetic clasp for easy wear. 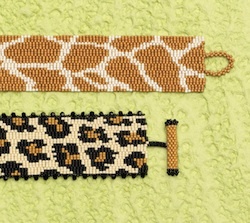 Animal instincts By Josie Fabre - Sleek and chic, these three-drop peyote stitch bracelets work up quickly, keep a low profile, and make a huge impact. 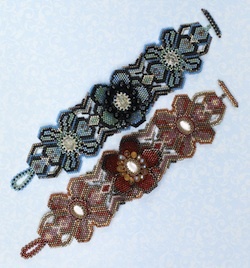 Victorian swagger By Sandra Lamoureux - Use basic bead weaving plus three classic techniques (peyote stitch, crossweave, and spiral rope) to showcase a favorite cabochon with a unique two-part bezel. 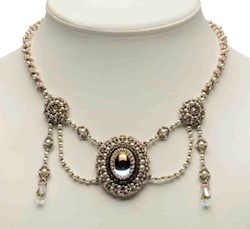 Mirror the design with smaller medallions and a matching clasp. 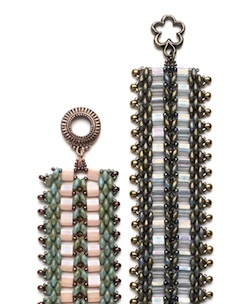 Tila trellis By Svetlana Chernitsky - Tila beads and SuperDuos fit together beautifully along with an assortment of seed beads for a bracelet that has a delightful drape when worn. 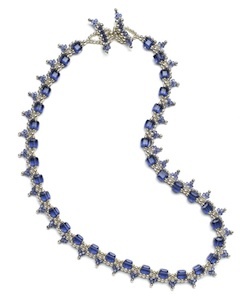 Faded denim By Connie Whittaker - Use peanut beads, crystals, and seed beads to make a bracelet that's as comfortable as your favorite pair of old blue jeans. 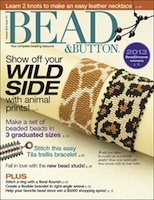 Covering a wooden bead By Anna Elizabeth Draeger - Learn to create a set of striped beaded beads in three graduated sizes to take advantage of inexpensive wooden bead sets sold in craft stores. Dreaming of diamonds By Alice Kharon - These elegant earrings look like fine jewelry yet are quick to stitch up and are easier on the wallet than real diamonds or gemstones. The value of dark and light By Margie Deeb - Light or dark colors in your jewelry convey more than personal preference – they convey meaning. In Part 2 of this three-part series, find out how color value affects the message of your work. 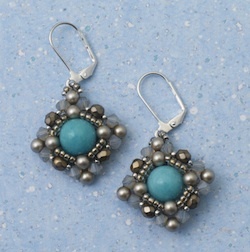 Cubes & cradles By Lynne Soto - Nestle crystal cubes in swags of metal beads for an elegant necklace and earrings. 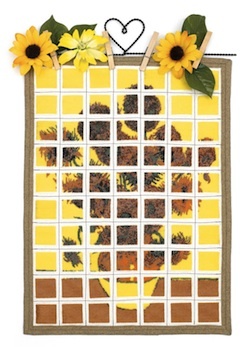 The great-big hearts of the Bead-It-Forward project By Stacy Werkheiser - Whether told in names, numbers, or faces, the story behind the 2013 Bead-It-Forward project is one of generosity! 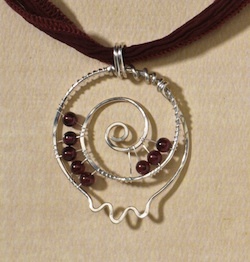 Pomegranate pendate By Irina Miech - Combine a healthy does of wire with few gemstone beads for a pendant that's as sweet as it is satisfying. 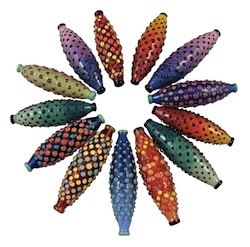 Object lessons By Maggie Roschyk - For Beau and Shani Barrett, bead making is more than a job – it is the evolution of effort, inspiration, and life itself.